The market for wearable technology is constantly evolving. While Fitbit has established dominance and continues to monopolize the attention of wearable consumers, various smaller companies are finding their own niche, with endless attempts to improve the role of technology in our lives. Whether it be a simple, efficient smartwatch from Pebble, an accurate fitness tracker from Microsoft, or a cleverly constructed piece of cardboard from Google, companies are finding ways to push wearable technology to the forefront of consumer technology. Sign up here to receive a monthly demand snapshot. Apple announced the much anticipated Apple Watch in September, after which consumers looked to other brands for their holiday shopping needs. The holiday season brought a large boost in wearables attention, but this quickly fell off as the gift giving ended. Several people are now waiting to receive their backlogged Apple Watch orders, so this downward trend can be expected to continue as consumers wait for Apple to catch up with demand. While consumers expanded their horizons by looking to several brands over the holiday season, Fitbit stole back attention post holiday to dominate mindshare in this crowded market. Garmin is one of the only other wearables companies to see increasing mindshare, while Microsoft, Misfit, and Pivotal Living saw short lived boosts, but are now losing attention. 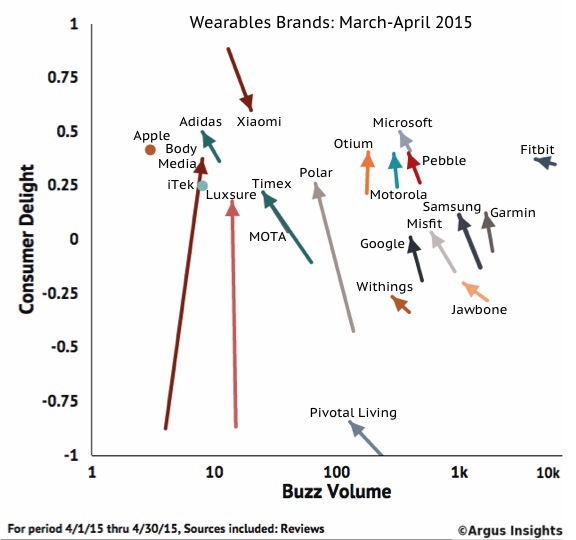 Microsoft, Otium, Pebble, and Motorola lead the global wearables market in terms of delight, but Fitbit is the overall market leader as they see the largest share of positive attention. While several people are still waiting to get their hands (and wrists) on the Apple Watch, initial consumer reviews situate the much-anticipated device alongside leading brands in terms of delight, but so far, the Apple Watch has done nothing to differentiate itself from the existing hoard of sensor filled smartwatches. Smartwatch users are interested in using their watches to replace certain smartphone functions, as things like alerting, texting, and navigation are top of mind. Fitness band users, however, are focused primarily on exercise related functionality, with little interest in smartphone replacement. Despite the type functionality users seek, battery life remains a top concern and lead detractor. There is a rich conversation about the potential of wearable technology in several different fields and forms on social media. Relative social buzz indicates the largest amount of interest is in smartwatches, but there is a growing awareness of the potential for use of wearables in the healthcare industry. With so many brands emerging in the Wearables Market, market leaders like Fitbit and Garmin are seeing consumer attention slowly split off. Find out all you need to know about the evolution of consumer demand in Fitbit and predicted future performance in the wake of developing technology, ahead of their IPO, in an exclusive Argus Insights Fitbit Demand Report. This monthly Wearables Demand Snapshot is your one stop for a consistent, comprehensive overview of the Wearables Market, sign up for a free monthly subscription here, and please, contact us with any questions or feedback that may arise about this report.